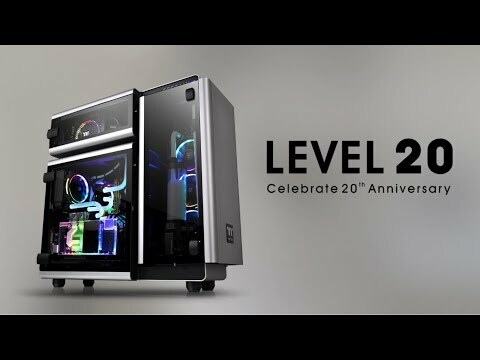 20 years of Delivering the Perfect User ExperienceThermaltake are celebrating their 20th anniversary, by gathering all the successful elements from the past two decades and merging them with the latest market trends to create the superior Level 20 PC case. Experience outstanding gaming sessions with supreme functionality, optimum ventilation and architectural aesthetics. Featuring a ventilation-focused, trio-chamber design with beautiful tempered glass panels and a tool-less locking system for easy access. Internally, you gain super-fast transmission with USB Type-C and USB 3.0, a TT Premium Gaming PCI-E 3.0 Riser cable and use of future-proof TT RGB PLUS software with voice control capabilities. The Level 20 also comes fitted with x3 Riing Plus 14 LED RGB fans, x2 Lumi Plus LED Strips and x1 Riing Plus digital controller to give you absolute control and true personalisation. create your dream system with thermaltake The Level 20 utilizes trio-chamber design to achieve optimal space management and ventilation. It separates the PSU, Motherboard and Storage/LCS into different compartments to create an exclusive component landscape and to offer even heat dissipation from the pre-installed 140mm Riing Plus RGB fans. All of this is protected by beautiful tempered glass panelling. Power Supply ChamberThis chamber supports both vertical and horizontal power supply placement for added versatility. It features an aluminium mesh panel to guarantee perfect airflow and ventilation of the power supply. Motherboard ChamberThis chamber can support up to E-ATX motherboards and up to 360mm radiators as well as 3x120mm or 2x140mm fans. The motherboard chamber can also house riser cable or AIO liquid cooling systems. Storage/LCS ChamberThe Storage/LCS chamber is capable of housing powerful data management or a liquid cooling solution system. The tempered glass door is perfect for showing off your components. make a statement with the level 20 Thermaltake has been evolving constantly over the past two decades in the PC DIY industry. From developing thermal ventilation optimization, gaming oriented design to architectural aesthetics they have now gone further by creating the Level 20. Constructed with distinct chambers and high precision CNC digital cutting aluminium mesh panels. The isolation of high capacity radiators and fans allow surplus interior space without compromising on cooling performance. Featuring three hinged swing-doors made with premium-quality 4mm thick tempered glass, assures window durability and viewing capability to thoroughly display your exceptional inner components. up to 11 drive locations Level 20 is packed with detailed functionality and insane storage capabilities with up to 11 drive locations, (3.5" or 2.5") with x6 at the back of the Motherboard chamber, x2 in front and x3 in the LCS chamber. Liquid Cooling compatibleE-ATX motherboards are also supported and the Level 20 comes with cooling fitment for CPU coolers up to 200mm in height, VGA lengths up to 310mm and PSU sizes up to 220mm in length. Speedy USB Type-C | four USB 3.0 Thermaltake do not hold back when it comes to using the latest technology in the industry to improve their products. The Level 20 is installed with speedy a USB Type-C port and four USB 3.0 ports for lightning-fast transmission speeds, allowing you to plug in your peripherals and play instantly. ultra-high speed riser cable The Level 20 comes with a Thermaltake TT Gaming PCI-E 3.0 Riser Cable, this premium quality, ultra-high speed cable comes with EMI shielding and allows you to display your graphics card or power supply vertically to show off their true potential. SMART TT RGB PLUS ECOSYSTEM TT RGB PLUS delivers endless possibilities for using colour, synchronizing lights to your tasks and PC usage, or synching them with additional TT RGB products and peripherals. This patented software lets users change the light modes, colours, speeds, brightness, fan speeds, and even supports AI voice control in IOS and Android devices such as Alexa and your own personal smartphone. say "hello TT" Use your voice to control the TT RGB PLUS App from your smartphone or Amazon Alexa and discover a hassle free way to set lights for your systems. You can ask it to turn the lights on or off, switch light modes, dim lights, change light colours, or adjust light and fan speeds to adapt to the way you play. via digital lighting controller Featuring x3 Riing Plus 14 RGB Fans to enhance the ventilation, along with x2 Lumi Plus LED Strips to fiercely light up your rig for added aesthetics. Customizable with 16 million colours, both fans and LED lights can be controlled by TT RGB PLUS software via the Digital Lighting Controller which holds up to five profiles. enjoy special effects during gaming Thermaltake TT RGB PLUS products are also capable of connecting to the Razer Chroma ecosystem. If you have installed both TT RGB PLUS and Razer Synapse 3, you can experience intense lighting effects that synchronize with your gaming. From cool down timers, health bars, flashy ultimate indicators and subtle ambient lighting to truly keep you immersed. Razer Chroma delivers an experience that transcends further than your screen. EXCLUSIVE DISMOUNTABLE MODULAR DESIGN The intuitive design and architecture of the Level 20 allows you to build your system with total simplicity. The included modular panels, racks, brackets, and pre-design mounting arrays let you say goodbye to those unreachable screw corners and gaps and truly enjoy constructing your dream PC.